As an example, let’s say a library sets-up a Manivelle display in its children’s section. The smart display could return available youth content and promote youth-oriented events. If the library sets-up another Manivelle display at the welcome area, it could show the calendar of events, information regarding services and activities, and offer search options to access library resources. Both Manivelle screens are in the same building and are connected to the same information network, but their in-building location tailors the content that is displayed on them. Furthermore, a single operator could manage these displays over an entire network of libraries and each library could curating content specifically for their location. • Embodying a vision of a smart and connected community. 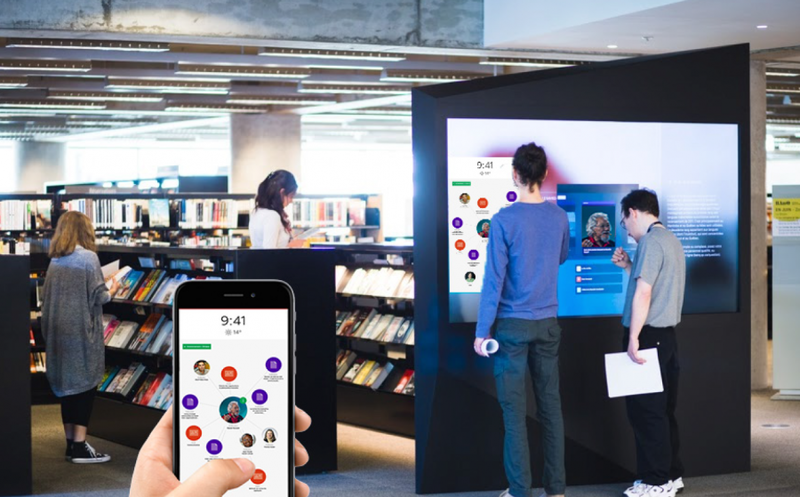 Since 2015, Manivelle develops interactive smart displays to distribute digital content in public spaces to inspire users to explore and interact with this content, through partnerships with public, national and university libraries. Manivelle’s strength lies in its harvesting software, which is used to aggregate content from various sources, such as public organizations or individual content providers. Manivelle then groups this content by category, subject matter, city or area of publication, author, publication date, or any other criteria the host establishment wishes to put forward. Content can be gathered from a variety of sources: various content catalogues, online services, databases of academic articles, calendars, news articles, art collections, research showcases, and many more. 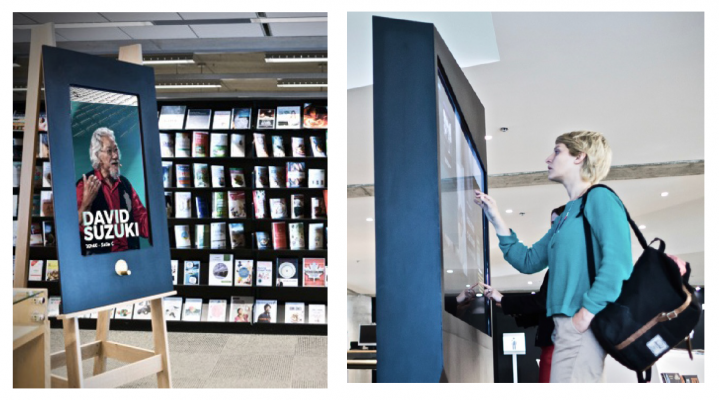 The Manivelle solution is deployed via a series of interactive smart displays installed in locations determined by libraries. The smart display doubles as a contextualized access point to an information network that broadcasts content relevant to the area, place or venue where it is installed. Manivelle wants to put innovation at work for libraries by helping them become connected locations where humans are key. Here are some inspiring projects that show off the diversity of configurations that Manivelle can take. The only limit is your imagination! An effective solution to meet the current challenges of public libraries: enhanced library services, increased use of digital content and improved communication with patrons. 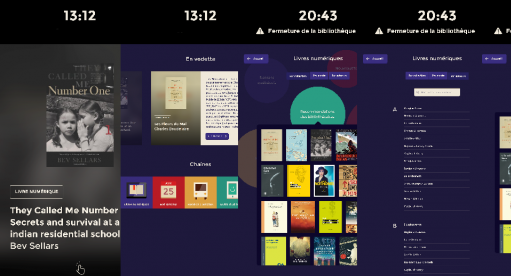 In cooperation with BIBLIOPRESTO, the Bibliothèque et archives nationales du Québec (BAnQ) and the public libraries of Québec City, Montreal and Brossard, we developed a smart display network of non-commercial content tailored to libraries. This network is deployed via interactive screens where users can discover contextualized content such as events, ebooks or archival records. This project is in constant evolution. We are planning to integrate new content and features soon. Two years after launching of the project, eight locations are host to the Manivelle network and thousands of users access their library’s digital content every month. The City of Sherbrooke and its partners initiated the "Sherbrooke Communauté Intélligente” roundtable to reflect on innovative solutions to issues specific to their community. One the challenges identified is to promote open data from the city of Sherbrooke and its partners in order to simplify and improve communication with citizens. The roundtable called upon Manivelle's expertise to analyze the possibility of deploying an interactive smart display pilot project within the city of Sherbrooke. Their objectives were to analyze the different contextual and competitive variables to digital signage, to make recommendations on relevant content to be broadcast, to evaluate the possibility of hardware deployment and to estimate the overall cost of such a pilot project. With the proposal report submitted to the city of Sherbrooke's roundtable, Manivelle is thrilled to be involved in finding innovative solutions to maximize the interaction of citizens have with open data. It lays the foundation for an ever-growing and smart community! We believe that data not only forges a community’s history and identity but also contributes to stronger user experiences. Jump into the movement and join the world of intelligent communities!